Faced with a potentially show-stopping problem with their sponsored Drum Corps International event scheduled for July 15, in Wildwood, N.J., the Jersey Surf has thought well outside the box to save a show in a classic drum corps venue. The corps found out last week that the construction of a new grandstand and a press box would not be completed in time for the event this Saturday evening. From the Jersey Surf Web site: With a little creative problem-solving and a nod to the history of "old-time" New Jersey drum corps, new bleacher construction delays won't dampen the spirits of loyal attendees at Saturday night's "Sounds of the Surf Summer Classic" drum and bugle corps competition at Wildwood, New Jersey's historic Maxwell Field. "I'm not sure if we'll be serving lemonade on Saturday night," says Bob Jacobs, the executive director of the Jersey Surf Drum and Bugle Corps, "but maybe we should be!" Jacobs isn't referring to the bittersweet summertime citrus elixir, but rather to the bittersweet dilemma facing the corps at the site of its self-hosted "Sounds of the Surf Summer Classic" competition this Saturday night. "It seems like more than a few lemons have fallen out of the sky to bean us on the head ... but we're going to make this work," he continued. Tickets have been sold, and pre-show sales are brisk. Corps from throughout the northeast are committed to attend, including both of the current World Champions in Drum Corps International's Division II and Division III. The famous Bayonne Bridgemen Alumni Drum and Bugle Corps will be appearing as special guests in exhibition, returning to Wildwood for the first time in more than 25 years. Great weather has been ordered for a tremendous Saturday evening event at one of the country's premiere family vacation resorts ... The Jersey Surf's trademark Italian meatball sandwiches are being prepared ... So what's the problem? 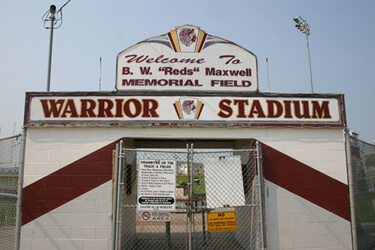 The challenge: The installation of a brand new, custom grandstand, featuring seating for some 1000 spectators and a new press box at Wildwood's fabled B. W. "Reds" Maxwell Field, will not be completed in time for the event, intended to bring competitive drum and bugle corps action back to the historic site of many NJ VFW and American Legion State championships through the early 1980s. Read more about Jersey Surf's keen problem solving skills on www.jerseysurf.org.